IRONMAN and the Greater Madison Convention & Visitors Bureau and the Madison Area Sports Commission have extended the contract to host IRONMAN Wisconsin in Madison through 2021. This year’s event takes place on September 9, 2018. IRONMAN Wisconsin has consistently placed high among athletes surveyed in the annual IRONMAN Athlete’s Choice Awards, ranking 2nd in 2016 and 1st in 2017 in Best Host City Experience. In 2016, the event tied for 1st in the best Overall Run, 9th in Overall Satisfaction, 10th in Best Race Venue, 9th in Best Post Race Experience and 8th in the Will Recommend to a Friend category. In 2017, the race was also selected 2nd in Overall Satisfaction, tied for 2nd in Best Restaurants, selected 3rd in Best Race Venue, topping in nearly every category from the year before. Nearly 2,500 athletes representing 27 countries and 48 US states registered for the 2017 event and approximately 25,000 spectators attended the race. Each year, nearly 4,000 people from Madison and throughout Dane County volunteer to help with the event, and its economic impact reportedly exceeds US$4 million. The IRONMAN Foundation provided over US$80,000 in 2017 in grant funding to local groups including a US$35,000 grant to the Madison Area Sports Commission to support the programming of Dane County youth organizations that connect children to sports activities. This year’s IRONMAN Wisconsin takes place on September 9, 2018. The race consists of a 2.4-mile swim, 112-mile bike and 26.2-mile run throughout Madison and its surrounding areas. 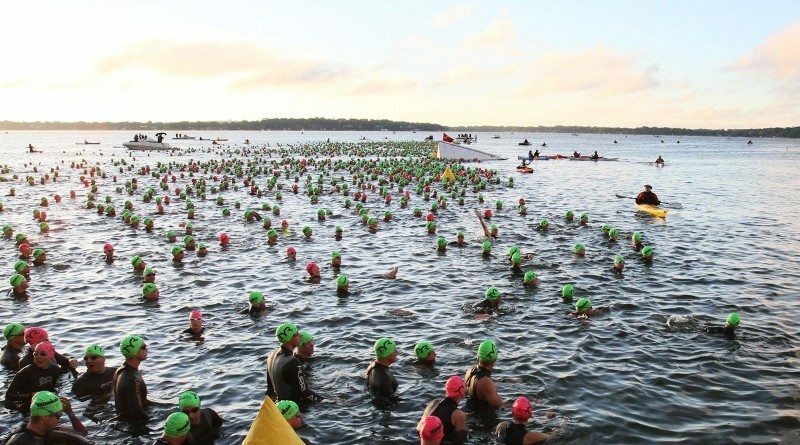 The swim will take place in Lake Monona, while the two-loop bike course will wind through rural Dane County, offering challenging hills and tough climbs. The two-loop run course will take athletes through scenic downtown Madison and the University of Wisconsin campus, offering spectator support and a finish in front of the capitol building. The event will offer 40 age-group qualifying slots to the 2019 IRONMAN World Championship in Kailua-Kona, Hawai`i.